Rev. Parnell R. Campbell believes that society has opened up and is practicing a greater level of tolerance towards the Spiritual Baptist community. 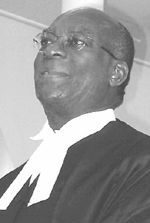 The well-known Queen’s Counsel and former Attorney General told SEARCHLIGHT that in view of what is happening in the world, people are beginning to understand that we are all pursuing the same goals, despite the various theological differences. The Spiritual Baptist community is preparing for the National Spiritual Baptist Recognition Day, on Sunday, 21 May. The day represents the official recognition of the freedom to worship for the Spiritual Baptists and a grand procession and divine service is planned. The procession, scheduled to commence at 1:00 p.m. from the Peace Memorial Hall and end at the Victoria Park, will be accompanied by the Royal SVG Police Band. A worship service will follow at 2 p.m. The four major Spiritual Baptist assemblies, The Spiritual Baptist Archdiocese of SVG under Archbishop Cosmore M Pompey, The Spiritual Baptist Organization with Bishop Devon Olliverre at its helm, Mount Carmel Archdiocese of SVG Inc. and the Mount Halibeth Church of the Epiphany lead by Archbishop Johonny Jones and Bishop Mary Bonadie respectively have joined together for the celebration. The Prime Minister, Leader of the Opposition and the Minister of Ecclesiastical Affairs are all expected to bring greetings at the service. Campbell, the chairman of the steering committee for the celebration, told SEARCHLIGHT that among the developments taking place is an offer from the Christian Council for a representative from the Baptist community to serve on the council.